When I read the story of a young American woman selling her ova for $7,000 in order to pay off her credit cards, I kept thinking about young women I met in China. They earned about $100 a month, yet saved 80 percent of their incomes to help pay for their siblings’ education. I felt a huge disconnection. Although many people are worried that the middle class in the West is shrinking, Americans still enjoy immense privilege compared to the vast majority of people in the world. To many Chinese rural migrants, enduring hardship is their way of life. When I asked what Liang Zi Fitness was, one of the girls politely handed me a menu, which described different kinds of acupressure massages combined with Chinese herbal medicine treatments. Having been cheated in a massage salon before, I was suspicious. However, since I did not have any plans that night, I thought I might as well try it. My favorite massage in China is always the foot massage that is not easy to find in the United States. So, I ordered an “empress foot massage,” which cost about $25. I was led to a room with a flat panel TV and a couple of massage couches. Before I sat down, a fruit plate and tea were served. Shortly after, my masseur appeared. He introduced himself as “Technician Number 30.” He was about twenty years old, attentive and gentle-mannered. His dark skin tone suggested his rural origin (peasants in China usually have darker skin tone because they labor in the field under the sun; light skin tone is considered more desirable in China since it implies the privilege of city life). In our conversation, I learned that he was from Henan province, which is one of the poorest provinces in China and produces the largest number of migrant workers. He told me the company recruited him and put him through a strict training program. He earned about 3,000-4,000 yuan ($400-$550) per month as a massage technician, with free meals and lodging. The company used a performance-based point system to encourage good customer service and adroit massage skills. That means the more customers who come back to the same massage technician, the more points he or she will earn, and the higher the rate of pay. I left Liang Zi Fitness late in the night. The lights on Jianguomen Avenue were flickering and shimmering through foggy air, like an abstract painting against dark sky. They were like the sparks I saw in the eyes of Massage Technician Number 30. With those sparks, any adversity or affliction is another stepping-stone to a better life. I have no doubt my masseur will be another Zhu Guofan, and he will be part of the middle class of tomorrow. 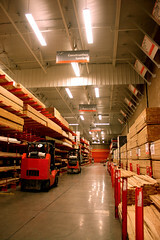 Why Home Depot Struggles and IKEA Thrives in China? At a time when China’s home furnishings market surged 17 percent, the largest U.S. home improvement company Home Depot has been struggling and closed five stores since it entered the China market in 2006. Analysts pointed to the fact that a “do it yourself” culture does not exist in China. True. Because labor costs are relatively low, many homeowners would rather hire someone to do the work than do it themselves. Apparently, Home Depot made the same mistake as some other companies that entered China without understanding the local market, which is often dramatically different from their home market.